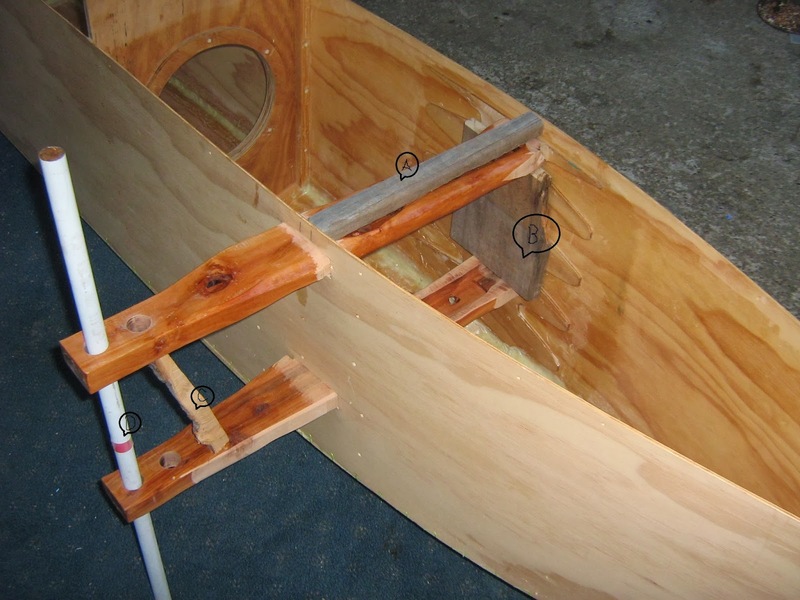 In a brave endeavour to sustain interest in this truly glorious and wonderful account of my proa build I have laboured all weekend (liar) to put the rudder mounts in. For starters I cut oblong holes in one side of No 1 hull. It having long been established that I am stupid and useless and everything I do is some kind of bodge, nobody will be surprised that I had to chop bits off my finished pieces to get them through the holes. The middle bits were too big; god knows how, but they were. While I was about it I drilled some 25mm holes in them for pintles. I would have drilled 25.4mm holes but for the fact that Sandvic only make 25mm hole saws, the rascals. A pintle - since my computer draws wiggly red lines under it - is what boat people call a Pin Tail, and it's what a rudder pivots on. Boat people - this has long been established - are incapable of encountering a word with more than one syllable without suffering an unconquerable urge to reduce it to something unintelligible. (Or as they themselves would put it, Bpleellible.) I don't know if I'll use 25mm pintles, but by drilling holes now it makes it a sight easier to do so later. The Optimist has little stainless steel eyes for its pintles, but stainless steel = £, and since I have applewood in abundance and since cog pins in waterwheels were made of applewood and lasted forty years of use, I have a fancy for wooden pintles. - This may have to be revised in view of shipwreck, if there is a shipwreck anon, & if it is caused by broken applewood pintles. Next I cut a stick of wood the same length as the deck is wide (A, above), and jammed the sides apart with it. Then I stuck the top rudder-mount through the hole, and fiddled around more-or-less endlessly with files and saws and general wood-chopping implements until the inside end mated with the far side. A temporary screw goes into the side of the hull and holds it in place while the glue goes off. Then I stuck the bottom mount through t'other hole, and in order to make these two mounts parallel I cut a short plank (B) to jam the far ends apart, and a short stick to jam the near ends apart (C), and with a lot of fiddling round with a 22mm pole (D) - because I didn't have a 25mm pole, only inch ones - persuaded myself that both sets of holes are in line. There are two lots of holes because I haven't designed the rudder yet, and I haven't done this because I'm stupid; see endless blog entries. Today saw lots of epoxy mixing and gap filling and whatnot, and, not having measured beforehand, I was pleased to find the whole is only 27 inches wide because that means it goes through the workshop door to sit in the sun and harden.